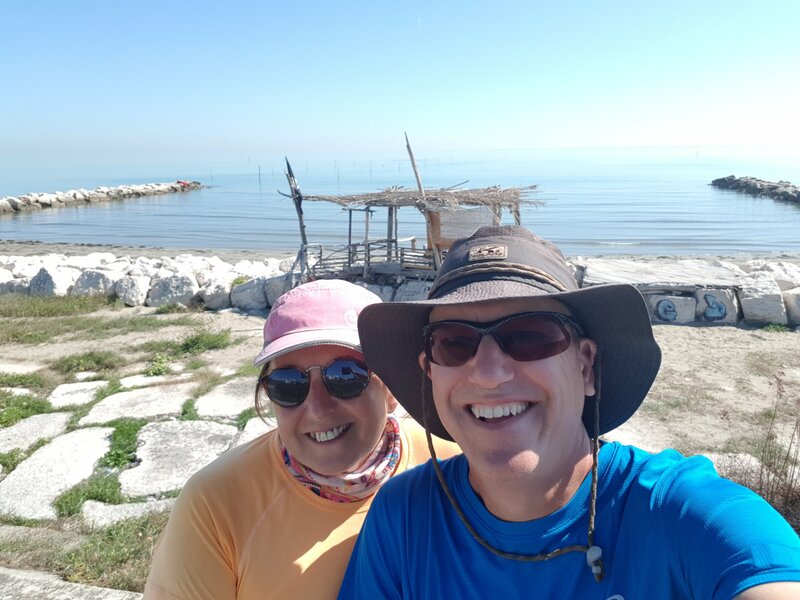 Leaving Lake Garda ( and the Dutch frites wagon) behind we headed on toward the Adriatic. The route skirts most of the mountains and is spectacularly beautiful. On one side you have mountains and the other is flood plain and as flat as Holland. The weather continues to be unusually hot but fortunately the Italians don’t tell us “It’s nothing to do with climate change” and the smoke continues to be ubiquitous. It really stinks here, and it doesn’t even keep the mosquitoes away! You really do end up with History overload though. 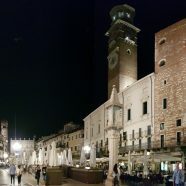 Italy has more historical buildings in one town than North America has on a continent and they have so many that as you cycle through small towns the castles that sit in the centre are just boarded up. And of course there’s that fellow Shakespeare who doesn’t help either making Verona a non stop procession of people looking for Juliet’s balcony only to find its locked away in a private garden and you can’t see it. 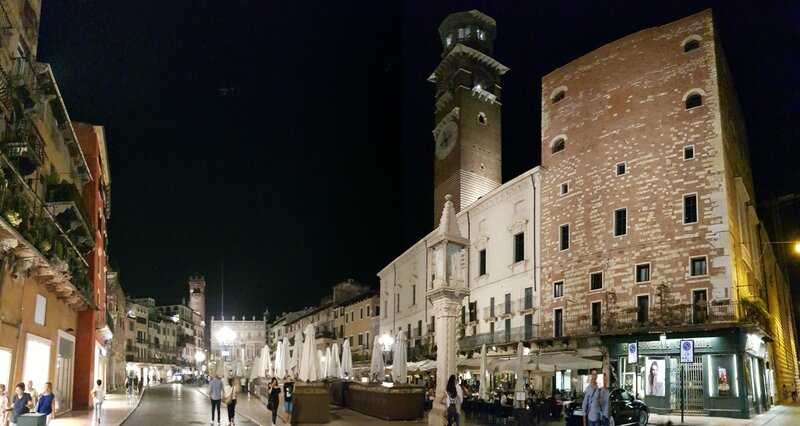 Mind you, getting a seat in the bar opposite and watching hundreds of people turn up with their guidebooks and look disappointed was something to do whilst we had our now traditional Aperatino. Which is drinks with free nibbles, which can be anything form a family size bowl of crisps to pizza, sandwiches, crisps, nuts, olives etc etc. All free with your drinks. Very civilized, and not a plastic plate or cup anywhere to be seen either. 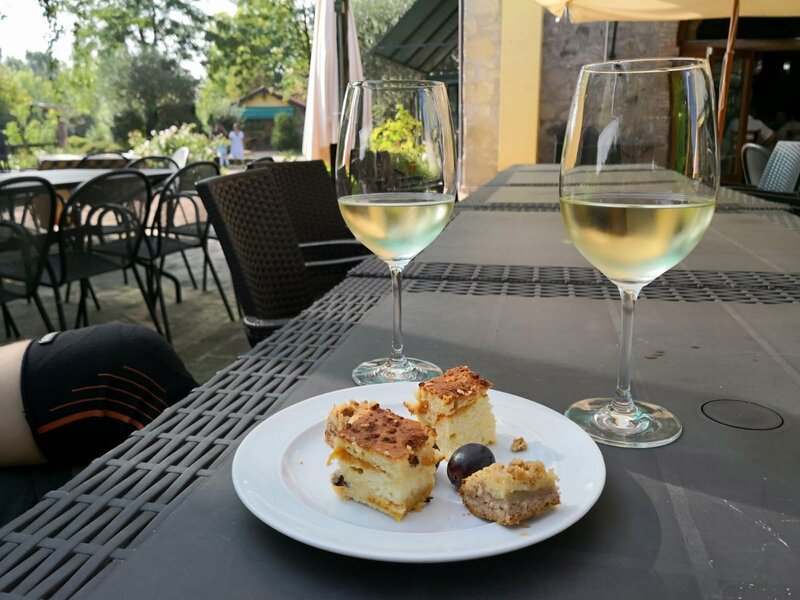 A little way from Verona is Soave and as some of you may know Linda likes the odd glass of wine now and again so we stopped off there. Another gorgeous town with a. Hill top castle, almost devoid of tourists and of course plenty of places to try the local tipple, which oddly enough we didn’t. The Gelatto is just too good to miss! In fact so good we stayed at an ice cream parlour for the night. 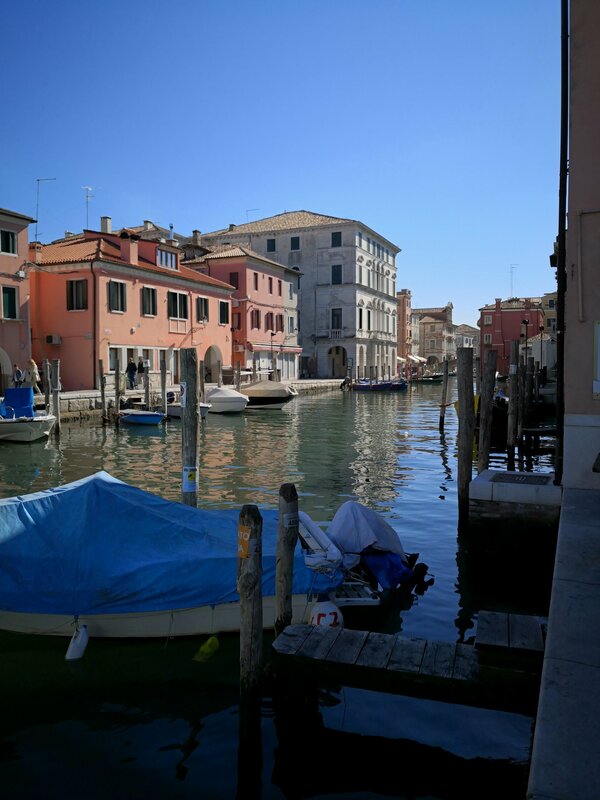 Our tour of gorgeous Italian cities continued with Padua and Mestre and of course more Ice creams before we skirted west of Venice and out to the tourists beach resorts on Lido do Jessalo – which were mostly shut up for the winter! With Venice and the Lido sucking all the tourists in the area south of the Lido de Venice is a land that time forgot and the small brightly painted fishing towns are deserted apart from the dozens of fishing boats moored along the miles of quays. 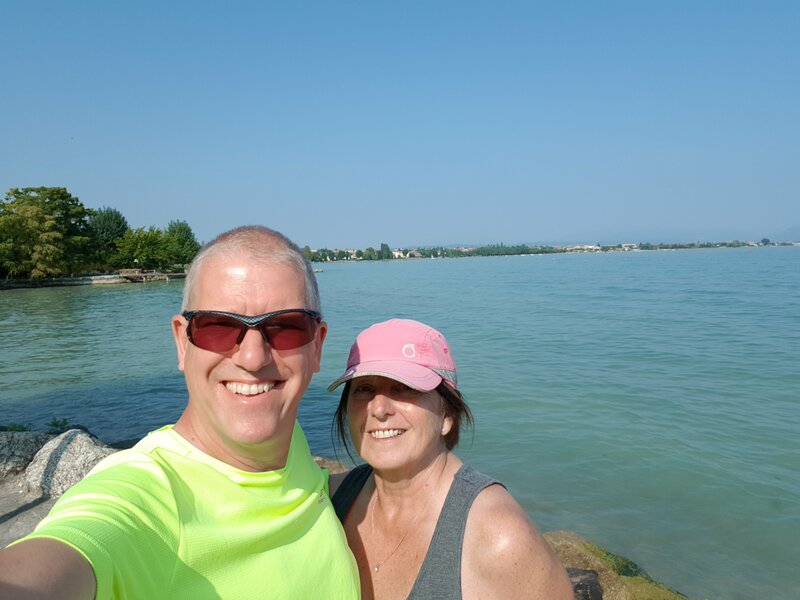 We loved this part – a great cycle route, a couple of ferries thrown in and no one else about. Heaven. Our last stop on the Adriatic before heading back inland was Chiogga which some years ago decided to promote ( or possibly subsidise) electic bikes and there are hundreds of identical tank like electic bikes with grannies to teenagers everywhere. 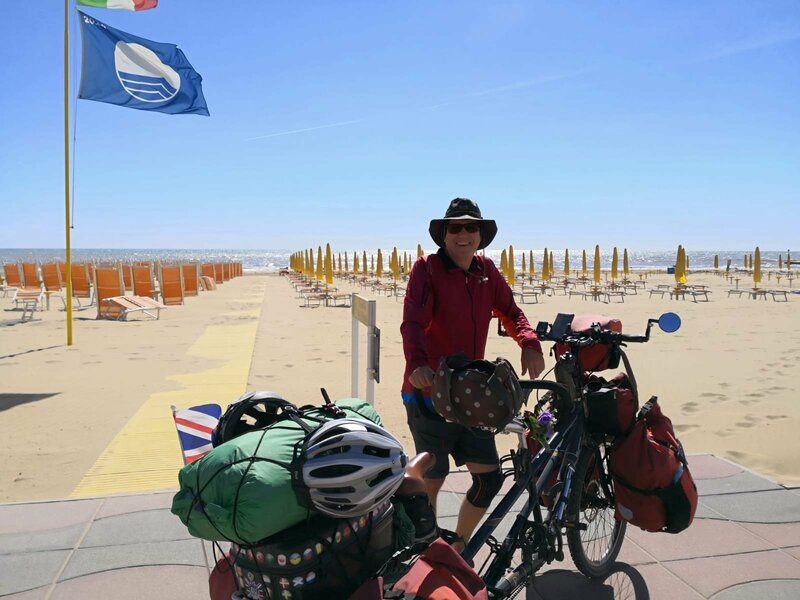 In true Italian fashion the speed limiters have been “tweeked” and now they zip along at a very healthy lick with Grannies leaving poor touring tandem cyclists in their dust. The town itself is a mini Venice but a real working town still. The beach is resorty and was also unsurprisingly closed for the winter. So from here we head west and back to towards Milan to fly home. But its still a few hundred Kilometers to go and I’m sure dozens of castles and gorgeous towns and ice creams await.